Are you in search of the best deer hunting scope for the money? Paralax, zeroing turrets, eye relief; researching scopes can easily lead to confusion and frustration. Look no further, in this article we go over our top picks for readers who want a quality hunting scope without breaking the bank. We focus on what matters, a scope you can depend on when the time comes. There is certainly a correlation between price and glass quality but you don’t need a top of the line rifle scope especially when new to hunting. This statement is sure to spark some debate but our opinion is why spend a ton of money on a scope when you don’t need to? We still use our top pick (Leupold VX-2) on our primary hunting rifles. While this is the most expensive scope on our list it still classifies as inexpensive as far as hunting scopes go. We don’t have statistics to support this claim but we think the VX-2 is the most popular deer hunting scope used today. Leupold has been manufacturing scopes since 1907 and has grown to be one of the largest manufactures in the world. Because Leupold manufactures so many scopes they are able to keep the price down even though the quality of their scopes is high. This scope only costs $240 which easily makes it the best deer hunting scope for the money. The variable power adjustment feels smooth through the entire magnification range. The finger adjustable turrets are 1/4 MOA per click and have a decent tactile feedback. The image clarity is crisp through the entire magnification range. In comparison to the other scopes we reviewed the Leupold VX-2 was the best performing in low light situations. We also compared it with a VX-3 found it hard to notice a difference in clarity. The glass is clear, the light transimission is the highest of the bunch, and it comes with a lifetime warranty. We can’t be stress enough how nice it is to deal with a company like Leupold when something happens to your scope. They are a first class company that makes first class products. Vortex came on the scene in 2002 and has really taken off in popularity. Once you look through a few of their scopes it is easy to see why, they offer impressive quality glass for the price. We prefer the Dead-Hold BDC reticle. Redfield has been making rifle scopes since 1907 and in 2008 they were purchased by Leupold. Along with that purchase can Leupold’s lifetime warranty that comes with all the scopes they sell. Taken from the companies website “Based in Oregon, the original home of founder John C. Redfield, we’ve rededicated ourselves to his vision: no-nonsense optics for everyone. Focused on that goal, we’ve made top-notch optical equipment accessible to every American hunter. With Redfield, outdoorsmen across this great land can fill their tag without breaking the bank.” Pretty cool if you ask us. The Redfield Revolution stands up to the no-nonsense optics vision. This scope is rock solid in terms of quality and construction. The picture is clear and the price is right. Highly recommended. If you are on an extremely tight budget the Bushnell Banner Dusk and Dawn is what we recommend. This scope is certainly worth every bit of $60. With that said we highly suggest you save up a bit more money and splurge on one of the scopes recommended above. Clarity: The picture must be clear and sharp. The colors should be bright. Light Transmission: The light transmission can have a significant impact when light conditions are less than perfect (dawn and dusk). Durability: The scope needs to be well made to endure the abuse hunting can expose it to. Warranty/Reputation: It is important to select optics from manufactures who have a strong reputation and good history with their customers. This weighed into our decision/selection heavily. Finish – All of the scopes recommended are anodized aluminum. Anodize is a chemical process done to the aluminum which applies a thin but hard protective layer. Color is typically matte black but many manufactures offer silver as well. Reticle – The reticle is the technical name for crosshairs. Reticles come in many different variations which only seem to be increasing. Objective – This is the diameter of the lens at the end closest to the barrel. The larger the diameter, the more light the scope lets in. The more light the scope lets in the better you can see, especially in low light conditions. 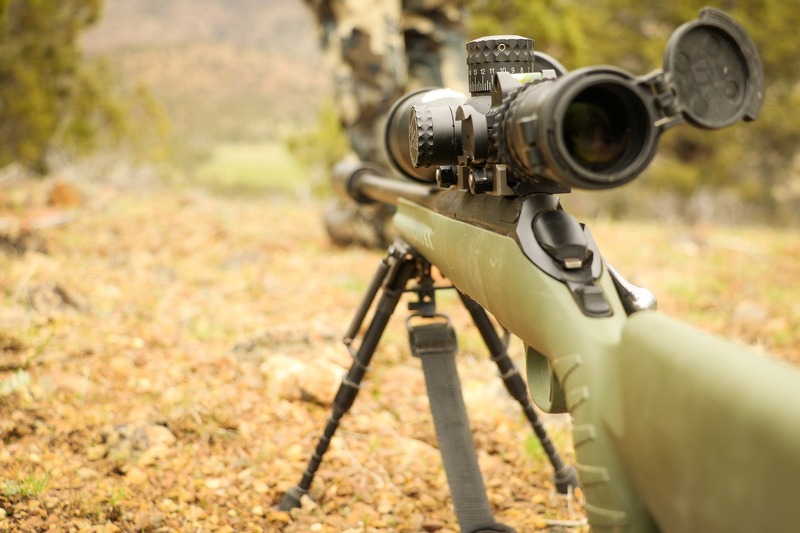 The larger the objective, the higher the scope must be mounted above the barrel of the rifle. Eye relief – Eye relief is the distance your eye needs to be from the scope in order to get the full picture the scope is displaying. If your eye is not at this distance you will see black around the edges and won’t be able to see the full circle of the lens. If you cannot see the entire circle clearly your shots will not go where you are aiming. Power – Power is another term used for the magnification the scope provides. Typically deer rifle scopes use anywhere from 3x magnification to 25x magnification. The higher the magnification, the less terrain you will be able to see through you scope although what you can see will be greatly enlarged. We recommend you go with the 3-9x magnification range when starting out. 3-9x magnification will suit the needs of new and experienced hunters alike. Moa/Mil Dot and Adjustment – We recommend moa adjustments because that is what 95% of hunters use and will be familiar with. Field of View – Field of view is how much area is displayed around the target you are looking at. Lower magnifications will display a larger field of view. Higher magnifications will display a smaller field of view but everything will be larger. Pair one of these scopes with the Ruger American Rifle we recommend in our beginner rifle article and you will have a fine hunting weapon. Whenever someone asks us what they should start out with our go to recommendation is the Ruger paired with the Leupold VX-2.